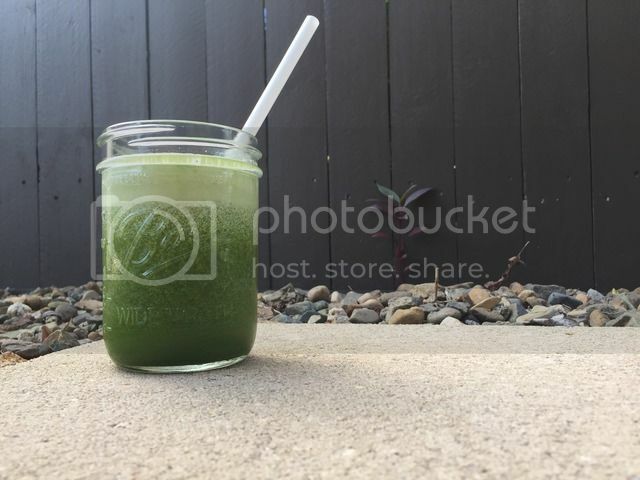 I recently had a DELICIOUS juice at a local organic cafe. Even though I LOVED the juice, and have wanted to have another one, I haven't gone back. Why not? Because I didn't want to pay another $10 for a juice! Especially when I have a juicer at home! So ... the other day I found a beautiful fresh pineapple and decided this morning that I would have a go at making a juice that was at least similar! It was EVEN MORE DELICIOUS that the one I had bought! And it was so easy to make. If you have a juicer, give it a go! I don't really have measurements. But here's what I did, in the best way I can explain it. I used two apples. I think they were pink ladies. I used three huge handfuls of fresh baby spinach leaves. I grabbed a big handful of mint out of our garden and I cut up that pineapple and used part of that as well. I'd say I used equal parts pineapple and apple ... but maybe a bit more pineapple if anything. I put it all through the juicer and that's it! A little trick I learned when I did a stint helping out in a cafe ... put the leafy things between more bulky items (like the apples and pineapple). It seems to help them as they go through the juicing process. What's your favourite things to run through the juicer? Let me know in the comments! Or over on my socials!